What is a Fixed Price Discount? A Fixed Price discount is a discount that sets the total price of one or more items to a set price. Examples include 3 blu-rays for $50 and all shirts $20. Enticify brings Fixed Price discounts to Commerce Server sites (CS does not support fixed price discounts) and does so in a way that respects Commerce Server discount interactions and is configurable via the Marketing Manager. Fixed Price discounts are also known as Price Point discounts. You have Enticify installed and operational. You know how to create a percentage or amoung off discount in Marketing Manager. Go ahead and create a discount like 20% off all items in category shirts. It can be any kind of discount, but I suggest you create some form of item discount. The images in my example configure an all shirts for $20 discount. Commerce Server and Marketing Manager do not support Fixed Price discounts. Therefore, if you want to keep using Marketing Manager, we have to be a bit sneaky in order to support Fixed Price discount configuration. We configure fixed price discounts by using a Naming Convention. Open the discount you created for editing. Switch to the "Base Properties" tab. Change the name of the discount so it includes the text "Fixed Price". You can use "fixedprice", "FiXED priCe" etc. Case does not matter and you can have a space or no space. Example of the Fixed Price discount naming convention. 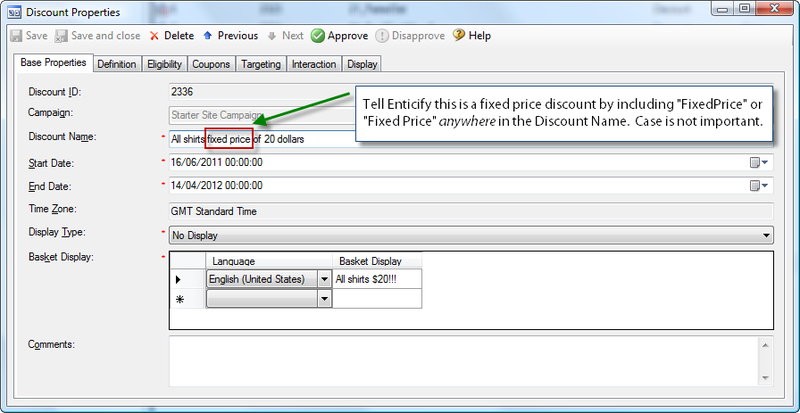 Configure a fixed price discount by setting the name correctly in the Marketing Manager Base Properties tab. Switch to the "Definition" tab. Enticify will ignore the Award Type so don't worry about that. Set the award amount to be the fixed price you want (in our example ?20). 4. Set Interaction, Eligibility and Coupons as Normal. You have already created a Fixed Price discount. 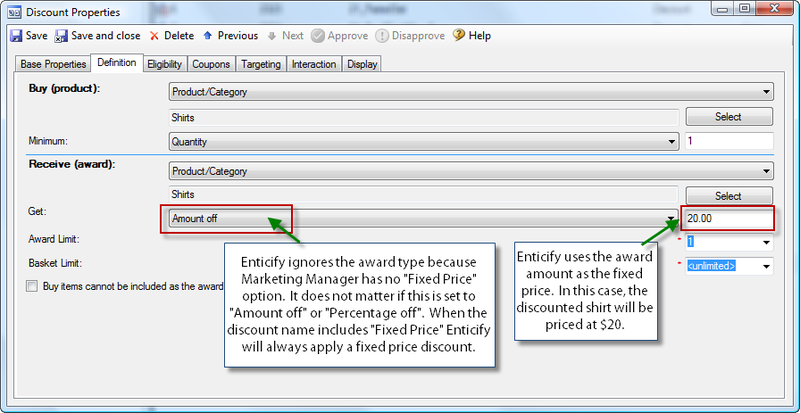 You can continue and treat the rest of the discount tab configuration as normal. 5. Try out your Fixed Price Discount! Save, Approve and Run your Fixed Price discount. It should all work as you expect!